The Stephen King short story collection, Night Shift, makes an appearance on the dash of the car. I had never seen Children of the Corn before now, even though I do believe I have caught the end of one of the many sequels before. There are parts of it that do not age well with a movie that came out in 1984, including some laughable special effects near the end, but I could see how this would have been scarier to me if I had watched it when I was younger. Comparing it to the Stephen King short story, the decision to explain what was happening ends up slowing down the movie. It tells when it should show. 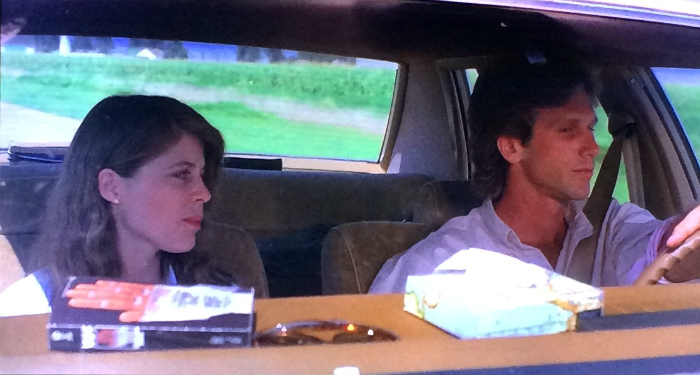 It was a pleasant surprise that the two main characters were a young couple on a road trip played by then-unknowns Peter Horton and Linda Hamilton. The trouble begins when there is an unnecessary voice over by a kid that tells exactly what happened three years ago in a small Nebraska town of Gatlin. The short story reveals the town’s sinister past slowly and it is more effective when the couple realizes with dawning horror what is actually happening in a town that seems deserted, but the children are in control. The annoying voice over adds nothing to the movie. The kid says what he is about to do before he does it. Unnecessary! His character is on the minor side so I am not sure why he is the choice for a voice over. When the two adults meet the children, it gets better. Isaac is the extremely creepy leader of the group. Perfect casting! 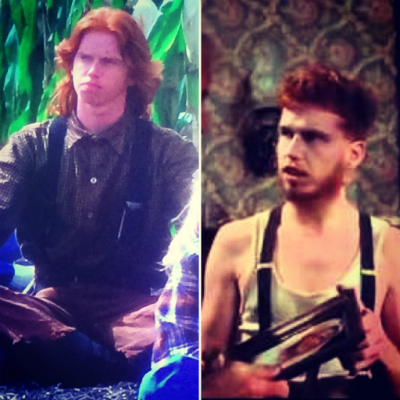 His second in charge is a tall, redheaded boy named Malachai that I stared at for half the movie before I realized he was one of the weirdo neighbors in The ‘Burbs. Malachai and Hans are both fans of old-timey clothing. There are a few scenes added in to pad the movie from the short story, which I did not mind. I also was not shocked that they changed the ending. Most of King’s short stories do not end on happy note and I am guessing Hollywood really did not want a depressing ending to the movie so it is more of a happy one. I prefer the dread and horror in the short story, including the ending, but the movie did get it right with the downright creepy kids. This movie freaked me out as a kid, now I just laugh.